surgical treatment of hemorrhoids the cost of surgery to remove nodes external hemorrhoid thrombosed external hemorrhoid treatment banana diet for 3 days and 7 days solar capsules beta carotene to better tan anti cellulite massage at home cups appetite before menstruation why before menstruation i want to eat a lot activated charcoal slimming is it possible to lose weight with the help of activated charcoal cellulite causes symptoms treatments corrective underwear abdomen and waist protein for weight loss black soybeans benefits and harms doctor review how to reduce the acidity of the stomach body wraps for weight loss belly best stretch marks creams for pregnant women how to choose a popular brand fitness during menstruation choosing a anti stretch marks cream after giving birth why should you run benefits and harms of running belly massage for weight loss how much protein fat and carbohydrates you need in a day to lose weight. A lot has a happened since the arrival of the first Traffic Speed Deflectometer (TSD) in Australia. 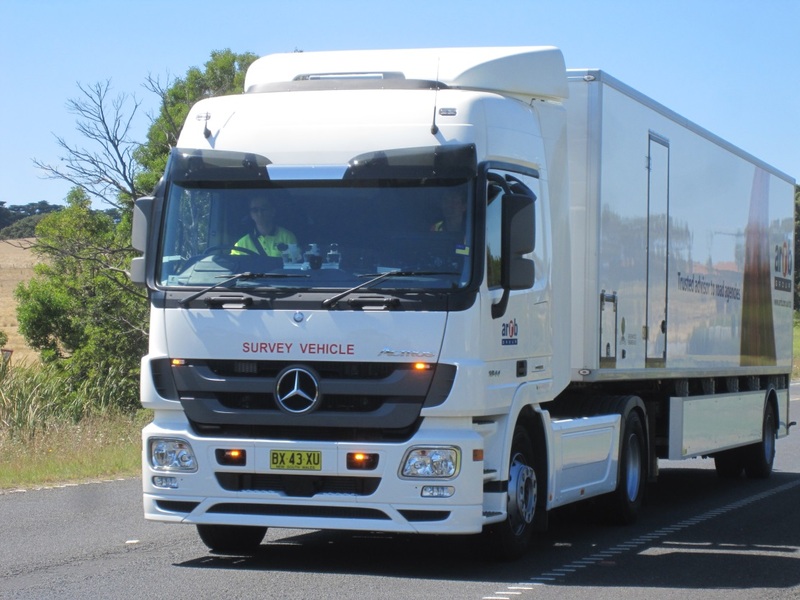 The fully integrated truck and trailer has now completed its first round of surveys in Queensland, New South Wales and New Zealand where it collected both deflection and pavement condition data across a combined total of 40,000 kilometres of state highways and roads of regional importance (see Figure 1). To complete the surveys the TSD had to travel a distance of over 100,000 kilometres (not to mention a return boat trip across the Tasman). The data was collected over a 12 month period. During its travels the TSD generated significant interest and was the subject of TV news reports and newspaper articles like the one shown in Figure 2. The TSD is now back in Queensland for the second time, where it is half way through a 20,000 kilometre survey. Several improvements were made to the TSD to help it cope with the harsher Australian climate, particularly in the outback. These included overhauling the air conditioning system, to ensure a more consistent temperature in the trailer, and also redesigning the measuring wheel, which fell off three times early on in the survey program. By the time the TSD reached New Zealand all the problems had been resolved and the survey was performed without any downtime for mechanical issues. In April 2015 a workshop was held in Brisbane to assess the performance of the TSD during its first year of operation. It received a positive endorsement from all three states and now several other road agencies are interested in undertaking TSD surveys on their road networks. Further progress has been made on Austroads project AB1907 Update of Road Condition Monitoring Specifications, Test Methods and Commentaries with a new format being introduced for all existing test methods. The rutting and roughness test methods were also updated to include provision for the use of 2D and 3D sensors. New test methods for the automated collection and reporting of cracking as well as deflection measurement using the TSD are due for publication later this year. In January of this year, ARRB Group took delivery of Australia’s first Traffic Speed Deflectometer (TSD), in response to the needs of several state road agencies. The system has since been fitted out with a host of other automated pavement data collection equipment, including a profiler and an automatic crack detection system, and then integrated into the Hawkeye data acquisition platform. The TSD, known as Matilda, has undergone acceptance testing and field validation trials and is now in the middle of a 20,000 km survey for the Queensland road agency. After completing this survey, the TSD will undertake surveys for the road agencies in New South Wales and New Zealand. This will keep her busy for the rest of the year by which time the TSD will have surveyed over 50,000 km of the Australian and New Zealand road networks. The introduction of emerging technologies for pavement data collection, such as 3D systems for automated crack detection and the TSD for deflection measurement, along with the willingness of the state road agencies to adopt it, has resulted in the need to update the relevant Australian test methods and specifications. This is currently being addressed by Austroads project AT1907, entitled Update of Road Condition Monitoring Specifications, Test Methods and Commentaries. The 26th ARRB Conference will be held in Sydney from October 19 to 22 with the theme ‘Research driving efficiency’. What a great reason to come and visit Australia! For more details please see www.26arrbconference.com.au.